Vipul Sarvaiya is a 53-year-old distributor of financial products, based in Uran, 65 km from Mumbai. He has lately been struggling to convince his clients to hold on to their mutual fund units. Since October last year, when the equity market started to rally, many of Sarvaiya's clients have moved out of mutual funds. "For the past few years investors have not made money on their mutual fund investments. With the market touching new highs, they were able to recover their cost and, therefore, many exited by selling their funds," says Sarvaiya who has been selling mutual fund products for the past 25 years. "People who have moved out have a simple argument - they would have earned more had they kept the same money in fixed deposits. Today no fresh investments are coming into mutual funds. They all go into fixed deposits and bonds." Indeed, in the last one year up to November 30, 2013, the equity assets under management (AUM) of the entire mutual fund industry has fallen by 10 per cent even though the BSE Sensex went up 7.5 per cent. Why? The track record of mutual funds in India does not inspire confidence. Most have not delivered the kind of returns that would convince investors to stay put for the long term. The equity AUM of India's top 11 mutual funds, accounting for 86 per cent of the total equity AUM of the industry, have struggled to give substantial returns over their respective benchmarks - the BSE Sensex or the NSE Nifty in most cases. 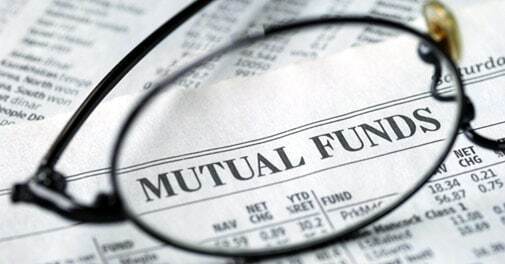 According to Morningstar, an independent mutual fund data provider, in the past year, only two mutual funds - ICICI Prudential Mutual Fund and IDFC Mutual Fund - have given stellar returns. 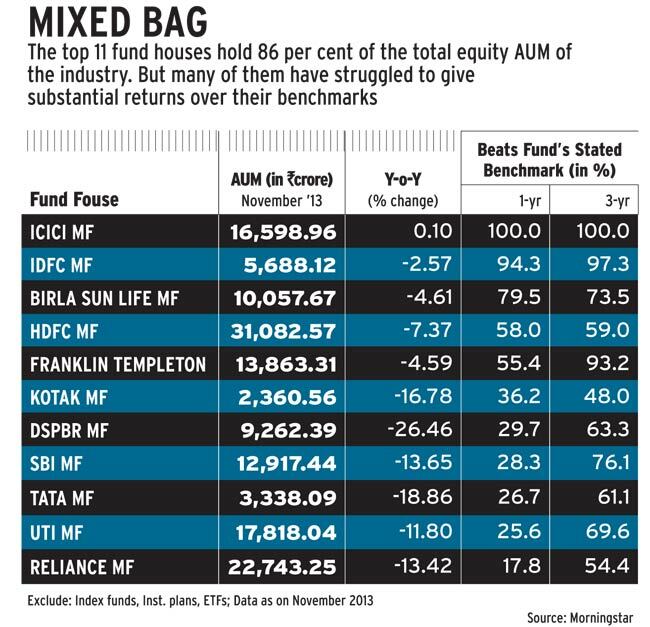 Almost the entire equity AUM managed by ICICI Prudential Mutual Fund and IDFC Mutual Fund beat the benchmark. But, in the same period, the other nine leading mutual funds - including biggies such as Reliance Mutual Fund, HDFC Mutual Fund and Birla Sun Life Mutual Fund - have seen their equity AUMs underperforming, most of them unable to beat the benchmark even by half. (See Mixed Bag.) Reliance Mutual Fund fared the worst, with only 17.8 per cent of its equity AUM beating the benchmark. Many fund managers have blamed it on the skewed market which favours select stocks. "The phenomenon is seen across the globe. Passive investment is in favour and this is the reason many active funds have underperformed," says Kenneth Andrade, Head Investments, IDFC Mutual Fund, which has been among the top performers. Fund managers attribute the trend to the underperformance of certain key sectors such as infrastructure and energy as well as the lack of participation of mid-caps and small-caps in the recent rally. Most fund managers, then, appear to have got it all wrong. For instance, India's largest mutual fund in terms of AUM, HDFC Mutual Fund had only 58 per cent of its equity AUM beating the benchmark. "The underperformance is due to the revamp of its portfolio by moving out of overvalued stocks, especially consumer staples, pharmaceutical and IT, which despite overvaluation remained in limelight over the last year," said a source at the fund house on condition of anonymity. This also impacted the fund's three-year performance with only 59 per cent of equity AUM beating the benchmark. "Focus on short-term performance, emotional bias in investment decisions and most importantly, no investment philosophy, has been the reason why mutual funds have been underperforming even their benchmarks," says Vikas Gupta, Executive Vice President at Arthveda, a Mumbai-based fund management firm. "If you see the large-cap funds in the last five years only seven of the 49 have beaten the benchmark." Star ratings of mutual funds by various rating agencies, too, have proved unreliable. These ratings are based on a fund's historical risk-adjusted performance compared with other funds in the same category. "The star ratings and relative returns have to go. These have been deceptive and investors have been taken for a ride. We have decided to focus on absolute returns and only sell funds to investors that have performed without actually considering star ratings," says Rajiv Bajaj, Vice Chairman and CEO of Bajaj Capital, a mutual fund distributor. He is doing it by concentrating on capital protection funds that focus on protecting the invested capital at any given point in time. "The primary focus of investors is protection of their capital which many mutual funds have not been able to ensure in the past few years. This has seen loss of confidence among investors who are moving out of the market." Bajaj seems confident that capital protection funds even on underperformance will give investors 100 to 200 basis points more than savings deposit rates of four per cent. Many in the mutual fund industry think it unfair to compare relative and absolute returns. 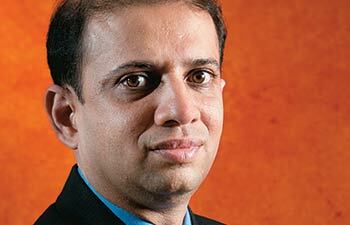 "Everyone thinks mutual fund returns should be two per cent more than fixed deposit returns. This is not possible. Mutual funds invest in markets which are volatile and, therefore, relative returns should be the real mirror of performance," says Nimesh Shah, Managing Director, ICICI Prudential Mutual Fund. He feels his funds have outperformed peers because of the strong processes followed at the fund house. "It takes time to execute any change. At least 1,000 days are required to get the set result," he adds. "None of my fund managers manages more than Rs 5,000 crore of AUM. More importantly, we have a culture where fund managers are encouraged to develop their individual styles, but at all times, these have to be within the overall investment framework." The challenging times are a wake-up call for the mutual fund industry. "It was a cruel year for actively managed funds, but the fact is only 150 of 750 funds are investment grade. The time has come for the industry to focus on solutions rather than products," says Sanjay Sinha, Founder and CEO, Citrus Advisors, a Mumbai-based financial advisory firm. Solutions are packages which help investors attain their financial goals. Some funds have already taken the route. Puneet Chaddha, CEO, HSBC Mutual Fund, concurs. "As a fund house we have taken a conscious decision to offer solutions to clients rather than just products," he says. Mutual funds will have to adjust to this new reality. Going forward giving healthy returns and selling solutions rather than products will be the mantra to survive and grow in the industry which seems to have a large pool of players but is actually dominated by a few.